can you guys let me know if its a good price or not, and what should i be looking for other then rust. , I'm thinking of offering him 5,000 dollars for the car, is that still kind of high. First time buyer. Attached a screenshot of the CL ad for when it's deleted. $7500 is too much for me... but it's your choice... how bad do you want it? Hey the car photographs well, that's for sure. You need to see it in person of course. Front and rear bumpers are gone (not that that's a big loss) but IMHO the rear should have been smoothed out before the repaint and the front the addition of the chin spoiler looks kind of goofy with the lower fascia parts missing making the turn/marker lights stick out. Engine bay repaint is nice but the engine itself wasn't really cleaned up when it was out. Those old flat top carbs can be trouble but if when the work, the work OK.
All the rest looks good in photos. Kick the tires, look under the carpet and take it for a drive. 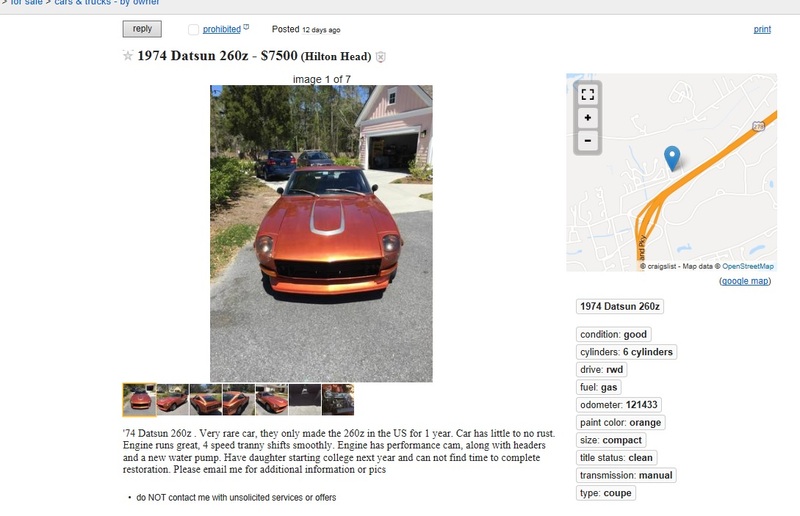 If the suspension was good (nothing feels loose) and the motor runs well, IMHO if you don't find anything else, $5,000 is likely a good buy but be prepared to negotiate from there. Bring cash. That really helps. Looking to purchase first Z31. New Member - 1982 Datsun 280zx! How was your first Ebay purchase?